For Sale: One - Used - Mitutoyo Bright A 1230 DNC operated CMM DCM 1684. Inventory item: DCM-1684. One used (second hand) Mitutoyo, Model: Bright A 1230, Model Number 4010M-3312, Cod 171-556; DNC operated CMM CNC Operated Coordinate Measuring Machine, Serial Number: M 008003, New in: 2001. 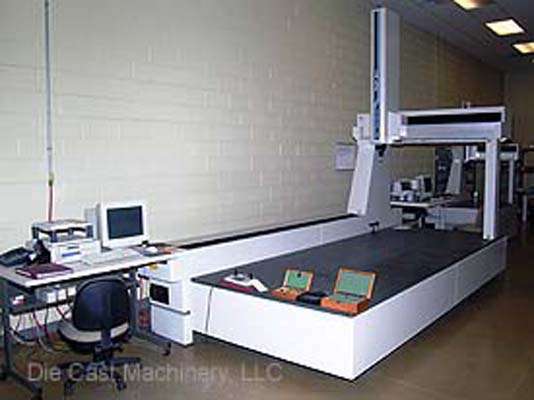 Equipped with 62" x 157 bed size, 42" under probe, Renishaw PH10M motorized probe, Mitutoyo GEOMeasure software and Mitutoyo MeasurLink STATMeasure/Real-Time data acquisition SPC software, DCM Inventory Number: 1684 This item is part of the Lunt Manufacturing Company liquidation. It may be viewed at the Lunt, Hampshire facility located at 200 Brandt Drive, Hampshire, IL 60140. To view all of the available items at Lunt Manufacturing, please click on View Machinery and then click on Lunt Manufacturing. To schedule an appointment to inspect this machine or other items at Lunt, please call our office at 847- 360-9170.